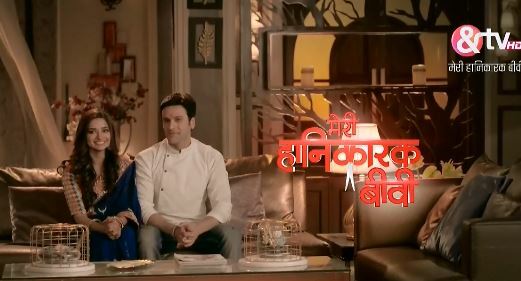 The Episode starts with Akhilesh asking Ira to drop Kunika home, he has some work. He apologizes to Kunika. Mishri gets happy seeing him follow her. She says Bhavik has told me the same thing. She goes to buy clothes for Ira. The man scolds her. Akhilesh scolds the man. Mishri says its nice coincidence to meet you here. The man says sorry, this girl can’t afford anyone. Akhilesh asks Mishri to buy anything she likes. He gives his card to the man. Mishri says if you pay, the gift will be from your side, its fine, come with me and help me in choosing the gift. Mishri takes Akhilesh and shows him a red saree. Akhilesh recalls Ira. Mishri gifts the man’s tie to Akhilesh. She wishes him happy valentines. She asks him to give her some gift. Akhilesh asks manager to show some kids’ clothes. He picks a dress for Mishri. He asks where is your mum. Mishri says she is at restaurant. He says she left you alone here, how irresponsible. Mishri says I wanted to surprise her, I will go. He thinks Ira will be with Mishri’s dad. He says I will drop you. Mishri says I will change clothes and come. He changes the tie on her saying. She wears the frock and comes. Kunika calls him. He asks Kunika to meet him at restaurant. He drops the wallet by mistake. Akhilesh and Mishri reach the restaurant. He thinks how irresponsible. Kunika says I m going on lunch date with Akhilesh, I will drive and go. Mishri goes and calls Ira. She asks her to come to restaurant fast, come wearing a nice saree, not as Bahadur Chacha. Ira gets decked up and gets a call. She learns about an emergency case. Her phone goes off. She leaves for hospital. Akhilesh signs Mishri and teaches her to drink the soup. She apologizes after bursting a balloon with toothpick. Kunika reaches there. Kunika collides with Bhavik. He says Akhilesh isn’t here, I have looked for him. She asks what, I will find him. He says no use, there is an imp meeting, I think I have to attend it, Akhilesh will be impressed if we crack this deal. Kunika says even I can crack this deal. He asks what about your date. She says Akhilesh isn’t here, take me with you, I want to impress Akhilesh. He says sure. He thinks Ira and Akhilesh get their lost love back. The man asks everyone to come on dance floor. People dance. Mishri signs Akhilesh that they will dance. He signs no. She gets sad. He goes to her. He thinks how can Ira do this, she left her daughter alone, but I can’t do this. He thinks why am I doing this. They dance on Raabta….. Mishri thinks your jodi looks good with my mum. She smiles and shows Ira to him. Akhilesh gets shocked. Mishri asks Ira to dance with him. She pushes Ira. Ira falls in Akhilesh’s arms. Mishri makes everyone clap. Mishri and everyone ask Akhilesh and Ira to dance. Mishri joins Akhilesh and Ira’s hands. They dance on Raabta….. Everyone claps. Mishri’s dream ends. Akhilesh asks Mishri to go and sit. Mishri looks around and thinks where is Ira. Precap: Akhilesh slaps the manager and gets arrested. Ira learns that Mishri is with Akhilesh.